I have not blogged in a few weeks, but I made these coasters today and couldn't wait to show them off. 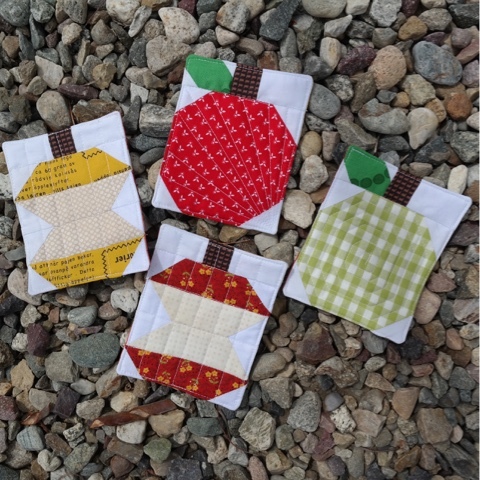 Last week my friend, @amysewvt on Instagram, showed some apples she was working on. I commented that they would make the cutest coasters, so that is exactly what I made today. I need a hostess gift for a friend this weekend and always like to gift handmade whenever possible. These coasters are super easy and all made from scraps. They finished at 4" x 4.5". My friend and I both love Fall, so this should be a reminder that our favorite season is only 6 weeks away. I used a Birch Organics print for the back of the coasters, making them reversible. A perfect Fall fabric. Lovely coasters, the fabric on the back is the best! Only 6 weeks untill Fall...? Time goes fast! If it's only six weeks until Fall, that must mean Spring isn't far off for me! Yippee! Love the coasters, both front and back! Lovely Di, and super cute! You know I love Fall too! Those are gorgeous, I am very envious of your friend to be receiving them! 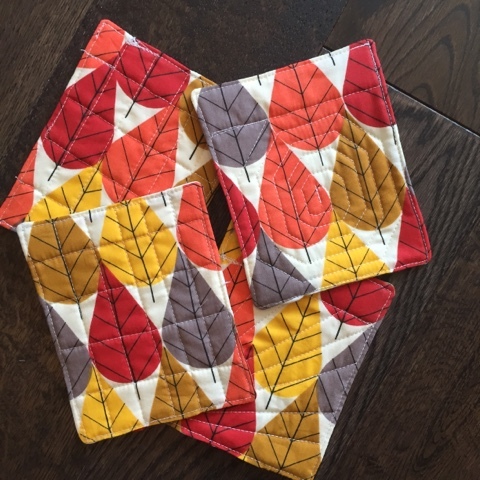 These coasters are really cute, also a great reminder that great blocks don't have to be turned into big quilting projects! I love the extra touch of different quilting! Such a cute hostess gift Di. I love Fall too, one of the things I really miss about the Midwest, winter not so much!